Welcome back to the series about becoming a Microsoft Teams Rockstar! Part 1 & 2 are wrapped up and we are ready to rock & roll to the next part in the series. We are discussing Bots, Chats, Meetings and Files. During the official Teams presentation, a bot called WhoBot was introduced. His role is helping users in finding people with certain expertise or skills. The bot is nowhere to be seen but I am guessing it’s going to be released during the upcoming Ignite event. Come on, who doesn’t like to have fun while chatting? I know I do! That’s where Teams comes in. You can use smilies, giphies, stickers and memes. You don’t have to use these, but “Fun Chat” can be used to lighten up the chat room, so to speak. The files I share with Alex are stored in my OneDrive for Business and vice versa. The activity tab displays all the activities of your colleagues in a Team or Channels. Of course, you need to have access to the corresponding Team or Channel to view the activities. You can use these as shortcuts to conversations, for example. You can add a shared tab to a website or Power BI report, allowing you to collaborate with one or more colleagues outside of a channel. Ideally, more options will be added soon. The availability status isn’t synchronized. You can be online in Teams but away in Skype for Business. All the members are now aware of the meeting and able to add the calendar to their own agenda. I love the new, not that new anymore but still, Microsoft! Allowing the integration with 3rd party services & tools. The main goal is getting the job done! No matter the tool or service. I hope this article showed you how Teams can really become your day-to-day work tool. 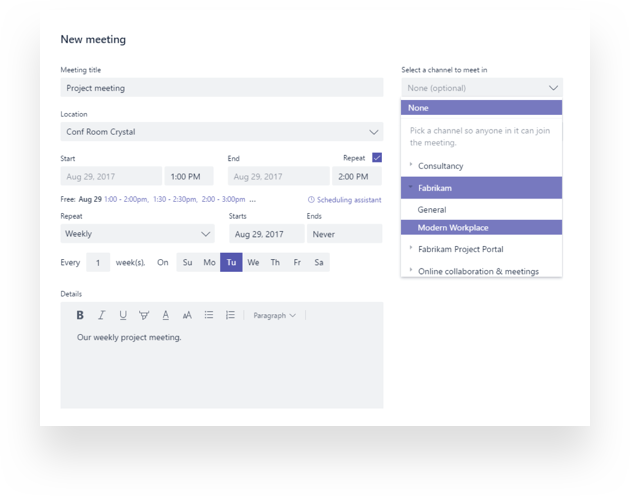 Apart from collaboration in teams and projects, you can chat with colleagues, view your agenda and your files. Office 365 services and tools are integrated into one application: Microsoft Teams. I am positive this is a huge selling point for Teams that will help increase adoption very quickly. That’s one of the main reasons I really love Teams and want everyone to embrace this promising Modern Workplace tool. Stay tuned for the final part in this series. Rock on!